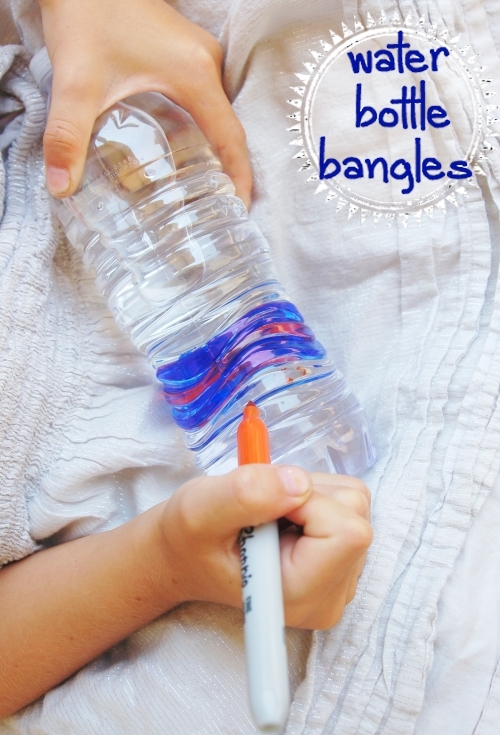 These Water Bottle Bangles are the perfect way to let the kids get creative this summer! It is a fun kids activity that will keep kids interested and entertained all summer long. If you are looking for more boredom busting ideas check out all our summer crafts and activities ideas to keep kids active and entertained this summer! The best craft bloggers are sharing fun kids crafts! From making Orange Granita Recipe to a DIY Stenciled Cork Board you will find fun creative ideas! My girls love to create things with and for their gal-pals. Most of the fun comes from the comrade of sitting together and scheming, matching their besties, etc. The wearing comes secondary to the process. This is the perfect girly craft for a slumber party. The kids can take it home, wear it, lose it and make a replacement! These bangle bracelets are made out of water bottles! Fun! And it is one of the family craft ideas found in the book 101 Kids Activities. Almost all of the activities are easy to do with supplies you most likely have sitting around the house! Using the markers, have the kids decorate the empty water bottle with markers. You can use the indented rings in many commercial water bottles to create color stripes and blocks. Cut the water bottle into 1 ½ to 3 inch wide rings. We suggest that you use two bottles if you hope to wear these for awhile. Color the top of the bottle, then wrap another empty bottle over it. The marker should be sandwiched in the bottle plastic. This will keep the marker bright and not scratched/rubbed off. A perk of the book, 101 Kids Activities, is that all the activities are broken down into ways that older or younger kids can enjoy craft, boredom buster or science project. If little arms are too small for wearing bracelets, this project makes the perfect size ring toy, a doll skirt, or a tunnel for toy cars. Check scissor cut areas for any sharp or rough edges and smooth with sand paper or cover with a durable tape. 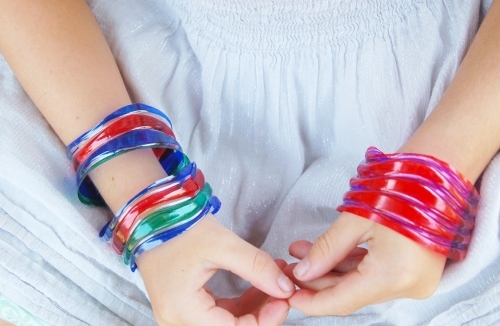 Kids can design their own bracelets of different widths and decorations for a planned stacked fashion statement. Have boys who don’t want to wear bracelets? Have them make a set in two separate colors and then use them for a ring toss game. These rings are harder to throw than they look. Once cut they are a bit floppy – great for silly fun. Mark an X on the floor and have the kids toss the ring into the center. This post was written by Rachel, one of the bloggers over at Kids Activities Blog. For more ideas like this one check out their book on Amazon or Barnes and Noble. This activity feature has been published with the permission of Page Street Publishing. Very creative and inspirational idea! Easy and fun! Thanks for sharing! My niece would love this! Can't wait to make these bangles together, it will be big fun!